In the second week of February I'll be flying out to cover my first Winter Olympics and you probably will not be surprised to hear that I am excited about attending. However, as a British sports fan and, let's be honest, all sports journalists are fans too, that is not an easy thing to admit. 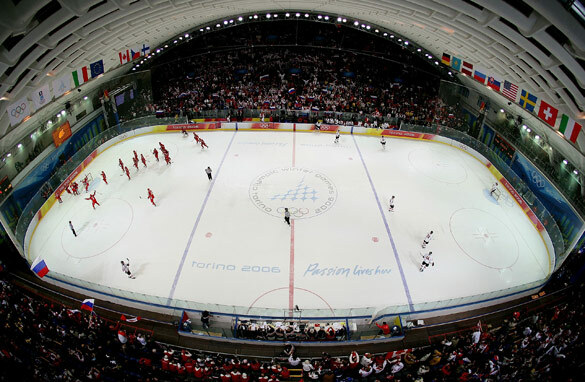 Can the Canada Olympic ice hockey team, seen here playing Russia (in red) in 2006, triumph as hosts and recruit a new fan in the process?. Though as a European there were the skiing greats such as Franz Klammer, Petra Kronberger and Alberto Tomba to celebrate, Britain's medal hopes in cold competition often melted faster than a snowman on a sunbed. Britain produced Jayne Torvill and Christopher Dean, who struck gold and revolutionized figure skating in the 1980s, but also ski jumper Eddie "The Eagle" Edwards, who did not soar into the sky as much as hold his nose, close his eyes and step off the end of the ramp. That was at Calgary in 1988 – an unbelievable Olympics. Why unbelievable? Because it was the first time Canada had staged the games, 64 years after they began. And because the host nation did not win a single gold medal. I hope the so-called commentator's curse will not affect things here, but I can't see that happening again this year. And I don't think I am going out on a limb to say the one sport Canada is most keen to triumph in is ice hockey. The men's team missed out on a medal four years ago and it caused a stir, but here is where I need your help dear readers. I've been a sports broadcaster for nearly two decades and reported on nearly all mainstream events – as well as some weird and wacky ones – but ice hockey is one sport I just don't "get." It's clearly fast and skillful and the players are even allowed to have punch-ups, a bit like rugby union which I enjoy. However, I just can't get excited about it. Maybe it's as simple as not growing up watching it or that I don't know most of the rules. Icing seems as indecipherable to me as football's offside rule does to my wife. Horse racing used to leave me cold too but a former sports editor loved it, made me learn about it and then I started to appreciate it. Although ice hockey doesn't float my boat right now it's still the event I'm most looking forward to watching in Vancouver. Why? Well, I'm guessing if the Canadians can't convert me into a fan no-one can. I highly recommend reading the book "The Game" by Ken Dryden. Dryden was the goaltender for the Montreal Canadiens (a storied franchise similar to Liverpool or Man Utd) during their dynasty in the 1970s. (Dryden is also a lawyer and Member of Parliament, and wrote the book himself rather than relying on a ghost writer). He describes the history of the game, and suggests that different countries' history with other sports (rugby vs. soccer) explains their differences in hockey styles. The book is beautifully written and gives you insight into Canadian culture and the culture of hockey, both of which will help you when you visit Vancouver in a few weeks. Enjoy your trip. Alex, a small, very small tip. Canadians never use the term "ice hockey." It's "hockey" and nothing else. Drives Canadians crazy to see "ice hockey" and you'll see it rarely, if ever, in daily use. Maybe the Olympic organizers will be forced to use it to cross cultural bridges but . . . . . . just drop the "ice" if you could. I am an avid fan and player, and having lived here in the UK for the past 10 years, have spoken to many many 'ice' hockey neophytes. I also had the pleasure to take 2 work colleagues, one from Paris and one from Mumbai to their first game in Madison Square Gardens. Neither had seen or knew anything about the game, but quickly got enveloped in the atmosphere which is always exciting, and I am sure you will find this when you are in Vancouver. One thing about North American sport venues is that there is no segregation of fans so you will have opposing fans sat next to each other, each in their own team colours, and rarely, if ever, do you see problems. Usually there is just good nature teasing as the main thing is to enjoy the sport for the sport. "Icing" is when a player shoots the puck behind the opposing team's net while still on his own team's side of the center line. Icing is "waved off" if the goaltender touches the puck, or if a player whose team iced the puck is the first man back to touch it. It is more than just our national game – it is our history. It is magnificent! "Hockey is the perfect Canadian game in that its highest values – teamwork, resourcefulness, tenacity, humility and triumph – are much how Canadians like to think of themselves on the world stage." Excerpt from "Canadians : A Portrait of a Country and its People" by Roy MacGregor, who also co-wrote "The Game" (mentioned above) with the fabulous Montreal Goaltender (now a Member of Parliament – was a law student at McGill University when he was Goaltender for the Habs). I would venture to say that you are probably starting with the idea that "hockey" should be similar to that in the UK. The similiarities between ice hockey and "hockey" as you know it (we call it field or grass hockey) is probably akin to the similarities between Rugby league and Rugby Union. They share some of the same terms and some of the same charateristics but are played quite differently. I would suggest that you take the advice of some of the others and clear your head of the idea of hockey in the UK, and learn about hockey in Canada. The speed and skills make it the "fastest game on Ice". I guess your next question will be on that other great Ice game "curling" which unless you are a Scott will also be a strange concept to grasp. Enjoy all Vancouver has to offer and feel lucky that you are paid to enjoy it all. Icing is mainly to prevent the opposing team under pressure in their own end from shooting the puck towards the opposing end; effectively forcing them to carry the puck out of their zone. This creates scoring chances for the opposing team on turn-overs, etc. If they do shoot the puck out of their zone, there is an automatic face-off in their zone which none of the players are allowed to change, while the opposing team may put out a new and fresh line. This of course, makes it much more difficult for the players on the ice to clear their zone when under attack. An important aspect of hockey Mr.Thomas is the length of shifts. You will notice that shifts are 30 to 45 seconds. Anything longer, and the opposing team will have a significant jump on you. Another important rule you will continually see his offside. The puck must pass the blueline before the player. I love hockey precisely because it so fast. And that speed means that alot of finesse and coordination is also required to do well. Admittedly, part of the reason I love hockey is because I was raised on it, as were many many other Canadians. For a Brit, I can understand it would be hard to 'get' hockey...you're not exactly the land of ice and snow. But I firmly believe its also simply a great sport. If you can, watch an NHL game before the Olympics. Its best if the home team is Canadian, as we have the most fanatical fans, for obvious reasons. If you want to enjoy the game of hockey. First thing: Don't watch the Maple Leafs. I love the comments already made (particularly Dryden's book), but I'd like to add one element of the game that hasn't yet been mentioned... the sounds! I'm jealous, enjoy the game!! Don't watch the Edmonton Oilers this year though (I live in Edmonton) as they will just be disapointing. Hockey is the same to Canadians as football(your football, not ours in NA) is to the English.Really, it's kind of like football actually, mixed with the physical-ness of rugby. It's a great sport to watch, because there is always action when play is going. Not like baseball, football (american), football(rest of world), basketball, curling...etc. Basically, you'll never get bored at a hockey game unless you watch two defensive teams like New Jersey and Minnesota go against each other. haha. rick, an excellent point, something similar perhaps to calling football "soccer" in the u.k. The first thing you will be surprised at is just how fast the game flows. When you see it on TV, it seems somewhat slow at times but in person, it is sometimes hard to track just whats going on. The next thing to realize is that hockey is Canada's game, hell we have a picture of kids playing pond hockey on our $5 bill. I don't think the rest of the world realizes how important a gold is to us as a nation. It is expected we win, not just give it our best shot. Heads will roll if we don't. Hockey, to me, is the best sport on the planet. Yes they make millions of dollars but how often do you hear a news story about a player bringing a gun to a rink, or getting in a night club fight or being caught for doping (the NHL has some of the harshest rules for doping, no one ever does it) or being that loud mouth "all-star" who thinks he is God's gift? You don't because they are all raised in a culture that values teamwork. The team always comes first and no matter how good you are, you are just a peice of that team. When you are at the games, talk to Canadians, talk to players, soak up the hockey culture and you will see why so many of us have such a passion for it. My Wife and I will be in Vancouver for the last week of the games. Travelling from Ottawa as these are the games of our time, not to be missed. We would be happy to spend a few hours over a meal and attending a game to bring you up to speed on how and why "the game" means so much to Canadians. With two kids under 10 in Minor Hockey and each our own very special personal history in the game, we'd be glad to help. We have our own tickets so don't think we are kidding. The Olympics is the pinnacle but the game starts for most on an outdoor sheet of natural ice and snow boards. I guarantee you that every Canadian on the Olympic team will have the same memories our kids will have, except ours were from yesterday on our front yard rink. All the other posters would be the same. I may ask for a walk through of cricket though as I “just can't get excited” about that one either. I agree with Rick. It's like using the term, "frozen tundra" when referring to Lambeau field. Redundant. Don't say "ice hockey". Actually offside in hockey is easier to understand than in football (the real one, not the NA version). In hockey, the last red line is the always offside line, no offensive player can enter before the puck (they can actually but not to receive a pass) In football the offside line is always the last defender, so that "line" keeps moving sometimes even fooling the linesman. The Calgary was the first Winter Olympics hosted by Canada, but the 1976 Montreal Olympics was the first. I barely remember it as I was so young; but after the tragic '72 Munich games Canada did a good job. I can't wait for the hockey matches. ESPN doesn't carry a lot of the NCAA hockey. Usually the Frozen Four through the finals. With the Olympic hockey, I'll get to watch some good games. The women are as much fun as the men to watch. Love the game, but the only time it's on regularly is the NCAA. Like I said, I love the game. If the NHL ever decides to play the game, I might even watch that. The reigning Olympic Champions Sweden, will be the team to beat these olympic games as well. With players like Zetterberg, Lidström, Henrik and Daniel Sedin, Backstrom, Lundqvist, Forsberg and more, we certainly look forward to beat Canada in the Olympic Final. Wouldn't that be sweeeeet! Icing: If the puck is shot from behind the center line into the end boards of the opposite teams end. (that is, behind the thin red line that extends from the goaltenders net). In most hockey, you can beat an icing call if the team that shot the puck can reach the end boards and touch the puck before the opposing team can touch it. In other leagues icing is called as soon as the puck crosses that end line). If icing is called, the play is brought into the zone of the team that originally shot the puck for a faceoff. In some leagues the players can still change, but in others the team that iced the puck cannot change while the other team can, making it an even riskier strategy to ice the puck. Offside is when a team touches the puck in the offensive zone when at least one of the players for that team had crossed the blue line to enter the zone before the puck had. This explains why a delayed offside occurs when a player enters the opposing team's zone before the puck does, but doesn't touch it. If the player then touches the puck the offside is called, however, if they leave the zone before any other members of their team cross the line, the offside call is averted. An offside is not a penalty, it simply calls for a face off near the blue line. These are the two rules that can give most new-comers the most difficulty to figure out at first, but before long it starts to seem very apparent.